This article is about the television station in Oregon. For other uses, see Katu. Not to be confused with KTUU-TV, KTWO-TV, or K2. KATU, virtual channel 2 (UHF digital channel 24), is an ABC–affiliated television station licensed to Portland, Oregon, United States. The station is owned by the Sinclair Broadcast Group, as part of a duopoly with La Grande-licensed Univision affiliate KUNP (channel 16). The two stations share studios on NE Sandy Boulevard in Portland; KATU’s transmitter is located in the Sylvan-Highlands section of the city. A construction permit for channel 2, Portland’s last available channel allocation on the VHF band, was issued to Fisher’s Blend Station, Inc., (later known as Fisher Communications) in 1958. However, KATU did not begin broadcasting until March 15, 1962, originally operating as an independent station. The station’s transmitter was originally located atop Livingston Mountain, about 7 miles (11 km) NNE of Camas, Washington. On January 19, 1964, KATU moved its transmitter site 21 miles (34 km), to Portland’s West Hills to improve its signal coverage. Just over a month later, it took over the ABC affiliation in Portland away from KPTV (channel 12) on March 1, 1964. This made KATU the fourth television station in the Portland market in less than a decade to have affiliated with ABC full-time (after KLOR, KGW—channel 8, and KPTV). It is also Portland’s longest-lasting ABC affiliate to date. KATU is the only one of the first five television stations in Portland to have operated out of the same studio (at 2153 NE Sandy Boulevard) since it went on the air, although the building had earlier been used as a laundry for many years. From December 2008 to June 11, 2009, KATU (and the other Fisher-owned stations) were not carried by Dish Network due to a dispute over retransmission consent compensation. On April 10, 2013, KATU and Fisher Communications’ other holdings were acquired by the Sinclair Broadcast Group. The Federal Communications Commission granted its approval of the deal on August 7, and the sale was completed the following day. On May 8, 2017, Sinclair Broadcast Group entered into an agreement to acquire Tribune Media – owner of CW affiliate KRCW-TV (channel 32) – for $3.9 billion, plus the assumption of $2.7 billion in debt held by Tribune, pending regulatory approval by the FCC and the U.S. Department of Justice’s Antitrust Division. KUNP would not have been affected as its contours do not overlap with either KATU or KRCW. However, as current FCC rules forbid broadcasters from legally owning more than two full-power television stations in a single market and require at least eight distinct owners after the creation of a duopoly (there would be too few remaining if a new one is created), the companies would have been required to sell either KATU or KRCW to another station group in order to comply with FCC ownership rules preceding approval of the acquisition; however, a sale of either station to an independent buyer was dependent on later decisions by the FCC regarding local ownership of broadcast television stations and future acts by Congress. On July 18, 2018, the FCC voted to have the Sinclair–Tribune acquisition reviewed by an administrative law judge amid “serious concerns” about Sinclair’s forthrightness in its applications to sell certain conflict properties. Three weeks later on August 9, Tribune announced it would terminate the Sinclair deal, intending to seek other M&A opportunities. Tribune also filed a breach of contract lawsuit in the Delaware Chancery Court, alleging that Sinclair engaged in protracted negotiations with the FCC and the U.S. Department of Justice’s Antitrust Division over regulatory issues, refused to sell stations in markets where it already had properties, and proposed divestitures to parties with ties to Sinclair executive chair David D. Smith that were rejected or highly subject to rejection to maintain control over stations it was required to sell. On June 25, 2012, KATU switched its second digital subchannel from This TV to MeTV. On January 15, 2016, KATU switched its third digital subchannel from GetTV to Comet TV. On September 6, 2017, KATU activated its fourth digital subchannel and added Stadium. On July 17, 2008 at 6:15 p.m., KATU conducted a test for viewers to determine whether their television sets were ready for the digital television transition by turning off its analog signal for 10 seconds, which the station conducted other times through the spring of 2009. KATU shut down its analog signal, over VHF channel 2, on June 12, 2009, the official date in which full-power television stations in the United States transitioned from analog to digital broadcasts under federal mandate. The station’s digital signal remained on its pre-transition UHF channel 43, using PSIP to display the station’s virtual channel as its former VHF analog channel 2. During the last segment of the station’s 11 p.m. newscast, anchor Steve Dunn reported from KATU’s master control facility giving last-minute information on the digital television transition before the switch occurred. Syndicated programming includes Live with Kelly and Ryan, Who Wants to Be a Millionaire, and Sony game shows Jeopardy! and Wheel of Fortune (since 1992; previously, they had aired on KOIN-TV). 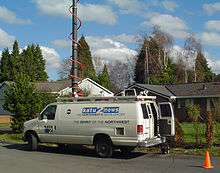 A KATU News van in 2007, sporting the old logo. Debra Knapp of KATU on set interviewing Oregon Secretary of State Dennis Richardson. KATU presently broadcasts 33½ hours of locally produced newscasts each week (with 5½ hours on weekdays and three hours each on Saturdays and Sundays). During the November 2006 and February 2007 sweeps periods, KATU finished in third place overall in the local newscast ratings, behind KGW and KPTV. In 2006, KATU won two Edward R. Murrow Awards, including an investigative piece reported by Anna Song on a newborn baby that was left severely brain damaged by OHSU hospital. Song also won dual first place (2006) Associated Press Awards in Best Writing, and Best Investigative Reporting. On October 11, 2007, KATU became the third television station in Portland to begin broadcasting its local newscasts in 16:9 widescreen standard definition. In April 2008, KATU introduced a revamped set that expanded to the entire studio that was designed specifically for high definition broadcasts in 2009. Previously, the studio was divided in half, with one side the news set and the other the AM Northwest set. The new set was one of the most expensive projects in KATU history. KATU started testing high definition newscasts on August 8, 2009. The full rollout premiered during their 4 p.m. newscast on August 17, 2009, making it the second station in the Portland market to begin broadcasting its local newscasts in high definition. Jack Faust – hosted the weekly public affairs show Town Hall for 13 years (1980–1993). Jeff Gianola – morning anchor/meteorologist, then evening news anchor (1983–1998). Currently evening news anchor at KOIN 6. Rob Marciano – meteorologist for KATU from 1997 to 2003, leaving to join CNN (and now with ABC). Tom McCall – former Governor of Oregon, served as an editorial commentator in the late 1970s. Roger Twibell – Sports reporter (1973–75), now Sportscaster for CBS Sports Network. Low-power translators in Mitchell and Wasco have been discontinued. KATU Heliport (FAA LID: 21OR) is a private heliport on the roof of KATU TV’s building in Portland, Oregon. ^ a b “Sinclair Broadcast Group Closes On Fisher Communications Acquisition”. All Access. August 8, 2013. Retrieved August 8, 2013. ^ Mike Rogoway (December 18, 2008). “DISH drops KATU from its lineup”. The Oregonian. Retrieved August 15, 2013. ^ “Sinclair acquiring Fisher Communications”. katu.com. April 11, 2013. Retrieved April 11, 2013. ^ Colman, Price (April 10, 2013). “Sinclair poised to buy Fisher stations”. TVnewscheck.com. Retrieved April 11, 2013. ^ Stephen Battaglio (May 8, 2017). “Sinclair Broadcast Group to buy Tribune Media for $3.9 billion plus debt”. Los Angeles Times. Tronc. Retrieved June 6, 2017. ^ Cynthia Littleton (May 8, 2017). “Sinclair Broadcast Group Sets $3.9 Billion Deal to Acquire Tribune Media”. Variety. Prometheus Global Media. Retrieved June 6, 2017. ^ Todd Frankel (May 8, 2017). “Sinclair Broadcast to buy Tribune Media for $3.9 billion, giving it control over 215 local TV stations”. The Washington Post. Nash Holdings, LLC. Retrieved June 6, 2017. ^ Liana Baker; Jessica Toonkel (May 7, 2017). “Sinclair Broadcast nears deal for Tribune Media”. Reuters. Retrieved June 6, 2017. ^ Harry A. Jessell; Mark K. Miller (May 8, 2017). “The New Sinclair: 72% Coverage + WGNA”. TVNewsCheck. NewsCheck Media. ^ Harper Neidig (July 16, 2018). “FCC chair rejects Sinclair-Tribune merger”. The Hill. Capitol Hill Publishing Corp. Retrieved August 9, 2018. ^ Robert Feder (July 16, 2018). “FCC throws Sinclair/Tribune deal in doubt”. RobertFeder.com. Retrieved August 9, 2018. ^ Benjamin Hart (July 16, 2018). “FCC Throws Wrench Into Sinclair Media Megadeal”. New York. New York Media, LLC. Retrieved August 9, 2018. ^ Edmund Lee (July 18, 2018). “Sinclair Tries to Appease F.C.C., but Its Tribune Bid Is Challenged”. The New York Times. The New York Times Company. Retrieved August 9, 2018. ^ Lorraine Mirabella (July 18, 2018). “FCC orders hearing even as Sinclair changes plans to sell TV stations to address concerns about Tribune deal”. Baltimore Sun. Tronc. Retrieved August 9, 2018. ^ Brian Fung; Tony Romm (August 9, 2018). “Tribune withdraws from Sinclair merger, saying it will sue for ‘breach of contract‘“. The Washington Post. Nash Holdings LLC. ^ “DTV Tentative Channel Designations for the First and Second Rounds” (PDF). Archived from the original (PDF) on August 29, 2013. Retrieved March 24, 2012. ^ Schulberg, Pete (April 28, 1993). “Jack Faust of ‘Town Hall’: big shoes to fill”. The Oregonian, p. B7. ^ Schulberg, Pete (February 19, 1997). “Now you see your favorite weatherperson, now you don’t”. The Oregonian, p. B1. ^ Nicholas, Jonathan (February 26, 2003). “25 bucking the trend”. The Oregonian, p. C1. ^ “Anchors and Reporters: Rob Marciano”. CNN.com. Archived from the original on February 21, 2013. Retrieved December 4, 2014. ^ FAA 5010 for 21OR.